Position the pork belly with the skin side down. Using a sharp knife, cut the pork belly into roughly 1½-inch-square pieces. The skin will take a little extra pressure to cut through, so be careful. Combine the pork and 3 cups of the water in a 4- or 5-quart pot. Bring to a boil over high heat, then reduce the heat to low. Simmer for 5 minutes to release some of the scum. 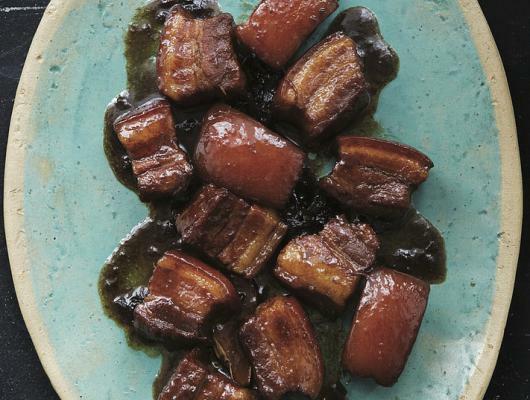 Turn off the heat and, using a slotted spoon or tongs, transfer the pork to a medium bowl. Discard the water and carefully rinse out the pot. Return the pot to the stove over high heat. Add the pork belly, 4 cups of the water, the wine, soy sauce, sugar, onions, ginger, garlic, and star anise, bring the mixture to a boil, and then reduce the heat to low. Simmer for about 1 hour, checking occasionally and stirring to make sure all the meat pieces spend some time submerged in the braising liquid. After an hour, if the sauce seems overly salty, add the remaining ½ cup water. Check the tenderness of the largest piece of pork belly with a fork. If there’s any resistance, the pork will need to simmer for 10 to 15 minutes more. As the pork simmers, the sauce will continue to reduce, intensify in flavor, and become a caramel. After 10 minutes, repeat the fork test. Once the pork belly is tender, increase the heat to medium to speed up the reduction process. Stir constantly to prevent sticking and to ensure that all the pork belly pieces are evenly coated with the caramel. When nearly all of the liquid has reduced, remove the pot from the heat. 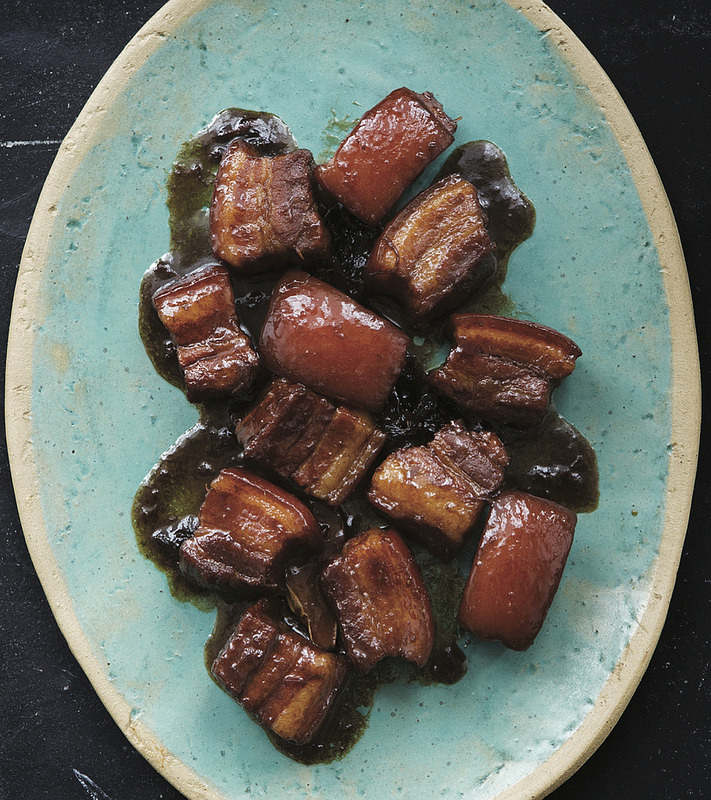 Arrange the pork belly on a serving plate or bowl, and serve with steamed rice.